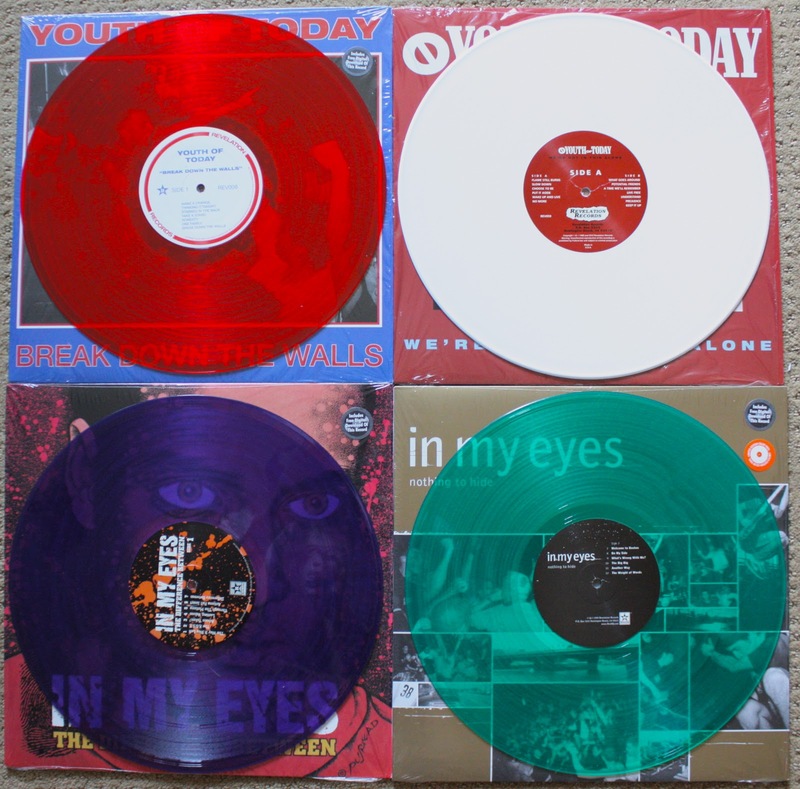 Across Your Face: Youth of Today and In My Eyes Re-issues are IN!!! Youth of Today and In My Eyes Re-issues are IN!!! So today I was thrilled to see that my Youth of Today and In My Eyes pre orders had come in! I looked on Rev and it said that the YOT pre orders were shipping June 7th! I had to rush and take some quick pictures to get up for everyone to see. So far it had been a mystery what the colors where going to be, so I'm sure that I wasn't the only who was anxious to find out what these reissues looked like. The Revelation RSD "Big 4" really has NOTHING on this "Big 4"! This Break Down the Walls comes on a absolutely gorgeous red, with the Wishing Well labels to boot! I was by far the most excited to own this vinyl out of all 4. I don't think Rev could have done any better, this thing looks fantastic. Next is Y.O.T. 's "Were Not In This Alone" with the Caroline cover art. This thing looks really great as well and was the only one to come with a poster. Now lets all stand around and grab our nuts. This is actually my first time owning any In My Eyes on wax. Here is "Nothing to Hide" on a very nice green. 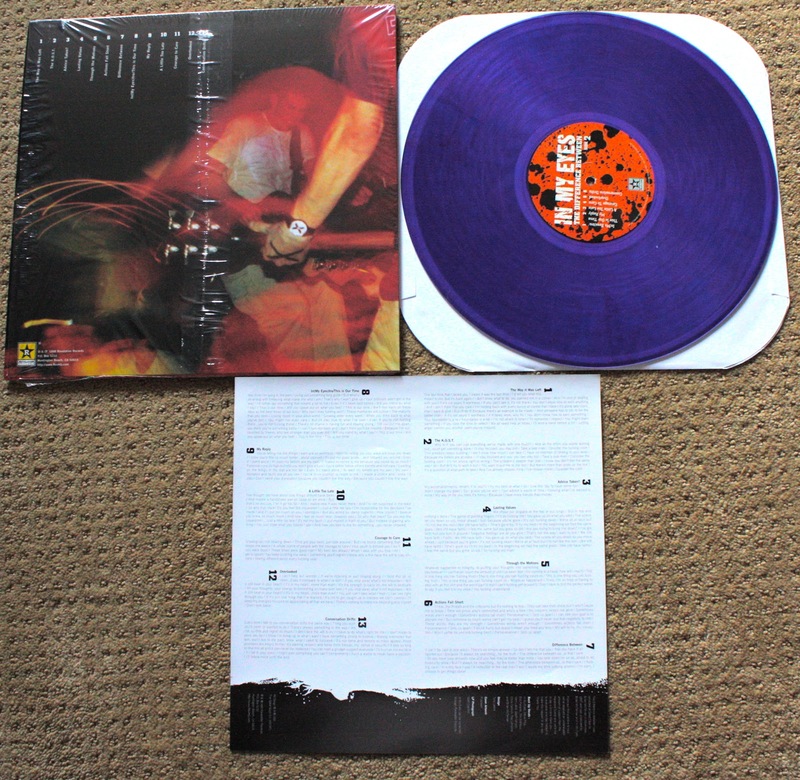 And finally "The Difference Between" on what is my favorite vinyl of all 4 of these, as far as color goes I mean. This purple looks really outstanding, I need to take a picture when I have more time of it in the light, you can see a slight swirl/marble effect in it as well. I will be waiting to see if Rev announces different colors. I have no idea the pressing info on these, but I'm keeping my fingers crossed that I got the most limited color since I got my pre orders in pretty fast. We'll see what other colors pop up as other bloggers start posting these. Now off to the movies with my girl.... enjoy! SSD - You think I'm joking? Youth of Today reissue madness!!! Wake up and FACE REALITY! I can't get NO RESPECT! VINYL NOIZE... Show me the Records!